Eucalyptus leaves are poisonous to children. However, the use of eucalyptus in commercially produced cough and cold remedies confuses the issue of toxicity. Complicating the issue even further, the leaves are available for use in herbal remedy tea. According to the University of Maryland Medical Center, eucalyptus historically has many uses and further research is needed regarding its medicinal properties. 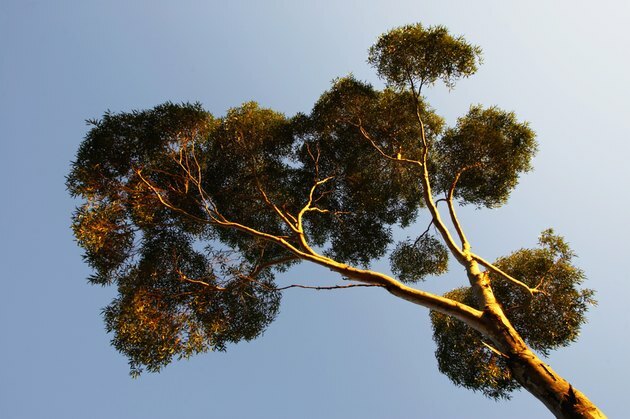 There are over 700 species of eucalyptus trees, which take the form of tall trees or shrubs. The trees are native to Australia, and also grow in Northern California and the Mediterranean. Tall varieties like the blue gum can reach 230 feet. Most eucalyptus are evergreens, and the leaves have oil glands. The leaves are shiny and long, and the tree also flowers and produces woody fruits that contain seeds. The bark is often rough, with a blotchy appearance. The leaves have a strong smell. All parts of the eucalyptus tree are flammable, and the trees have been known to burst into flames. In warm weather, the oil from the leaves can vaporize into the air and form a haze. Oil distilled from the leaves of the eucalyptus was used in Australian Aboriginal medicine. The oil was applied topically to heal wounds. Leaves were made into a tea and used to treat fever. In 19th century England, hospitals took advantage of the antibacterial properties of the oil to sterilize urinary catheters. The oil and leaves also have expectorant properties. Today, eucalyptus is used in commercial cough lozenges and mouthwash. The oil is used externally for rubs intended to relieve congestion. The leaves are widely available as an herbal remedy for use in tea to treat sinus congestion, bronchitis and the flu. These products are not designed for children. According to North Carolina State University, the leaves and bark of the eucalyptus are considered poisonous in large amounts. If too much is ingested, nausea, vomiting and diarrhea can result. It is possible for an overdose to cause a coma. The oil should never be ingested in any amount, as it is highly toxic. The oil from the leaves can cause a skin irritation, but this is not considered serious. Children should not ingest eucalyptus in any form, including in cough drops. If the child is over two years old, eucalyptus rubs may be safe, but use them only if directed by a physician. Adults should consult a qualified health practitioner before ingesting teas made from eucalyptus leaves. The leaves are toxic if ingested in large amounts. External use is safe for adults. North Carolina State University: Poisonous Plants: Eucalyptus spp. What Are the Benefits of Eucalyptus Leaves?